an exploration of the potential of using large-scale city imagery data set (Google Street View) in understanding and reading the cities. First I will explore the use of city imaginary data in Collecting Spatial Statistic that can be used in the studies of urban planning and design; I will discuss my experiment about mapping urban greenery and mapping building façade colors in 4 American cities. 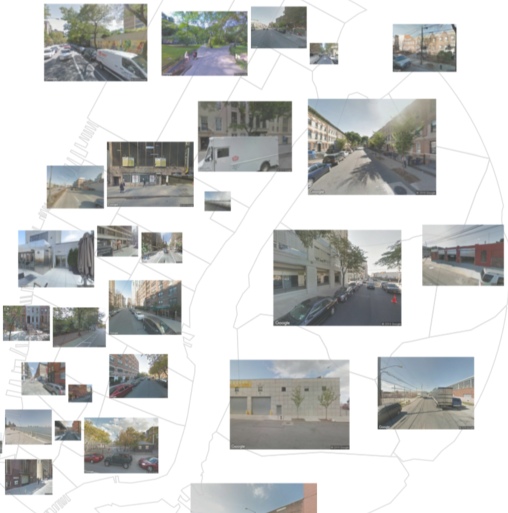 Then I looked at the problem of visual resemblance particularly, and played with a Convolutional Neural Net and train it to identify visually similarity patterns by recognizing cities / neighborhoods from their google street view images. Finally I undertook an exploration into latent urban characteristics that can be reflected visually. The dataset for this research is collected using Google Street View API from 4 American cities: Boston, Chicago, New York and San Francisco. 4 images are sampled from each grid point within a 6 km radius region covering the major urban area. In order to retrieve information from images, the first step is to isolate visual elements in images. The method I used here is SegNet, a neural network prediction model which calculates the possibility of each pixel in this image being in any of the 12 categories. Simply counting the number of pixels in each class already suffices a lot of tasks such as mapping the coverage of greenery across city region, where I can use the number of tree pixels as a proxy; Also sky area should be interesting because it might correspond to building height or urban density; Building areas should be relevant to study the architectural style etc. But studying building styles usually involves some additional steps; for example in this case I was looking into the dominant colors of buildings across the city and how that varies from region to region, so I did this by color quantization using Mean-Shift Algorithm, which was to cluster the RGB values of building façade pixels and extracted the one color that has the highest number of pixels, as the representative color of this coordinate. 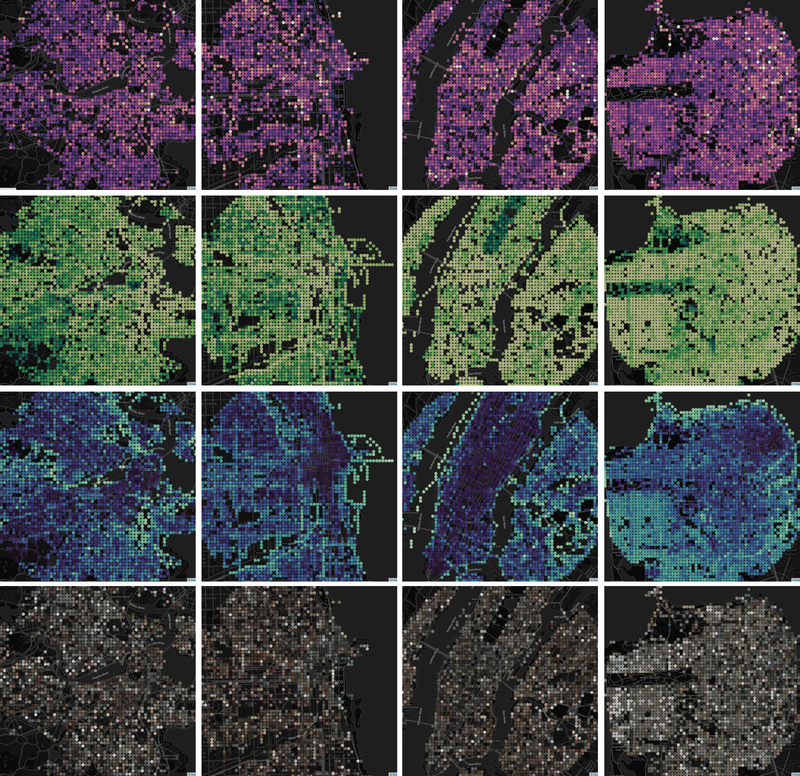 This visualization presents the urban imagery dataset after the algorithmic digest. 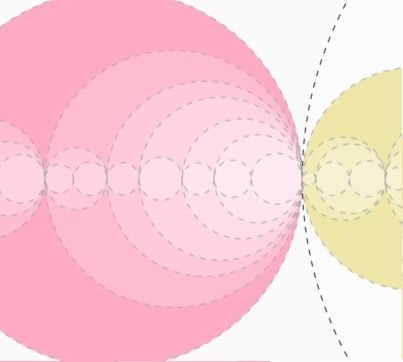 Each polyline represents one image; its intersection with each axis is determined by its attribute value. Brush the axes to see the whether the spatial distribution of visual signals aligns with your conception about these cities. Click on the map to see whether the attribute values make sense. So far we’ve looked at “named”, hand-designed visual features. In order to evaluate visual similarity in a more comprehensive way, much more visual features are needed from each image, and an automated process is required for feature extraction. Thus a convolutional neural nets (CNN) is needed for feature extraction. We used AlexNext structure in MatConvNet framework and trained 2 models to classify images according to their city names and neighborhood names, respectively. The figure above shows how error rate and energy descends as the training epoch increases. 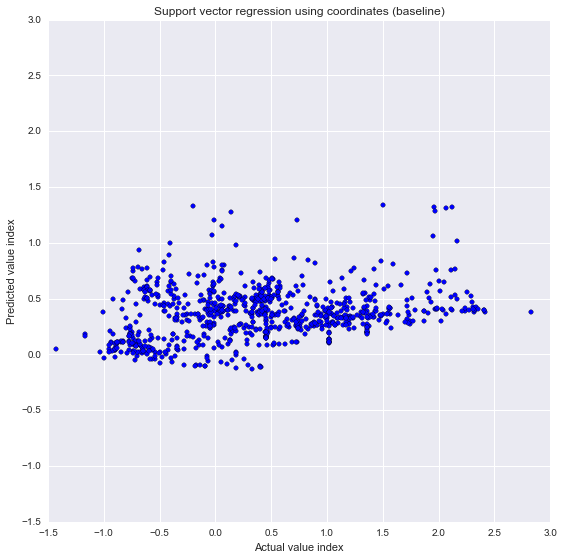 Also noticeable is that recognizing neighborhoods is a harder task than cities judging from the final error rates. So let’s look at what the algorithm has learned and whether it makes sense to human beings. Here I plotted the top 10 confident predictions for each of the 10 cities. It's discernible that those from the same category demonstrate some visual similarities, which generally conform to human's impression about those places. Apart from what’s being captured by the algorithm, what the algorithm cannot learn is also interesting to know. Intuitively, some neighborhoods are more similar to each other than others, which might reflect important facts about the cities including zoning, cultural influence, or the trend of urban sprawl. How are we going to discover these? Here is a way to evaluate which neighborhoods may look similar to each other. 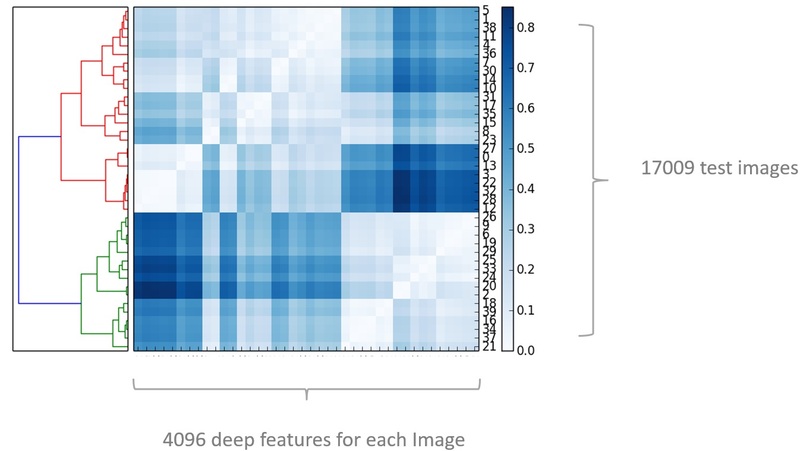 On the left, I recorded all the cases of mis-classification, which formulates a matrix with ground-truth categories ("real" categories of each image) on the X axis and predicted categories on the Y axis. The matrix in turn can be considered as a node-link graph where nodes represent all the categories and links represent the levels of similarities between each pair of categories. Then a Spectral Clustering Algorithm can be applied to this graph and cluster the nodes based on how strongly they are linked with each other. The Node-Link chart shows the affinity graph based on visual confusion among neighborhoods, which are represented by circles whose colors denote their city. Their spatial approximation is determined by link lengths which are reversely related to their visual similarities. 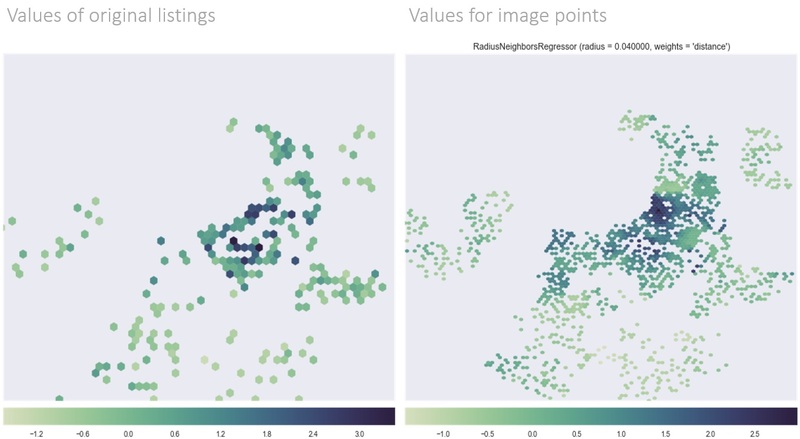 3, The method is not adequate to detect visually similar sub-regions among different neighborhoods, an interesting pattern that indicates how prototypical design patterns have influence across borders. And that’s why a new method is needed in order to redefine the boundary of neighborhoods, possibly purely from image features, using a bottom-up approach. Here is how I went about it. Going back to the neural network, instead of looking at the prediction result, I only extracted the second-to-last layer of the neural nets which contains “deep features” of each image. These feature are extracted by all the previous layers, and are just ready to do the classification. Then I implemented a bottom-up clustering algorithm on these features. In this matrix you can imaging that each row represent each of the images, and all the columns represent all the 4096 features of each image. The way this algorithm works, is by merging the most similar pair of images into one cluster, and then merge with the second most similar, and then the third… all the way up to the top there everything becomes one cluster. 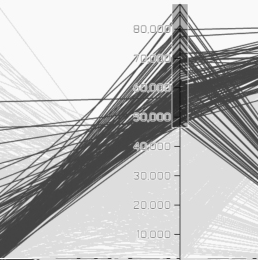 The nice thing about this algorithm is that not only it produces a specific clustering, but also computes a hierarchy of clusters and we can cut the dendrogram at any desired threshold (i.e. level of similarity), to get any number of clusters. Click on th root node (which contains all the images) and watch it branches out. Different colors in all three charts represent the same set of images. From the tree diagram on the top, you could find out the similarity hierarchy, as well as the threshold level at which they are merged with sibling categories (indicated by their X coordinates). 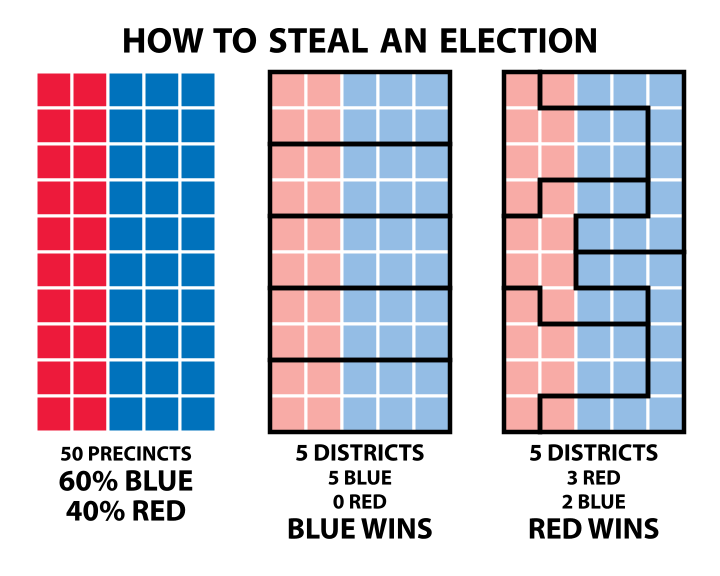 On the other hand, the circle-packing chart at the bottom expresses more clearly the containment or parent-child relationship between different sets of images. The sizes of the circles correspond to the number of images in that set. Also, click on the circles there to view samples of images from each set. The last piece of the research is an evaluation about what connotations the idea of visual similarity might have in non-visual aspects. I decided to asses whether we could predict housing prices using image features. Using web-scraping and API provided by Zillow, I was able to collect 500+ housing price listings from the City of Boston. 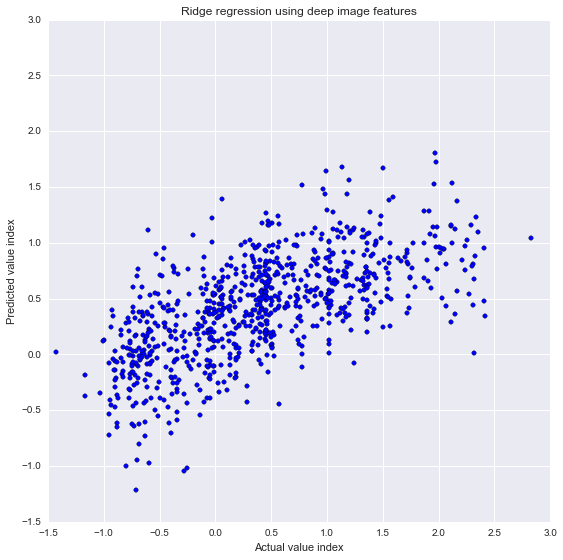 I assigned the values to the image points and used Ridge Regression to predict unit housing prices (normalized by area and housing type) based on deep image features only. The chart below (left) is a scatter plot comparing the actual prices (X axis) and the predicted values (Y axis). The prediction is not great (R squared = 0.4); but nevertheless much better compared with the baseline model where I only used image coordinates as variables. Result: Taking into consideration of what the place looks like results in a higher predictability.